The 116th Congress is set to break records in term of diversity among its lawmakers, though those changes are coming almost entirely from Democrats. Women and nonwhite candidates made record gains in the 2018 midterms. In total, almost half of the newly elected Congressional representatives are not white men. Those changes come almost entirely from Democrats; Republican members-elect are all white men except for one woman. 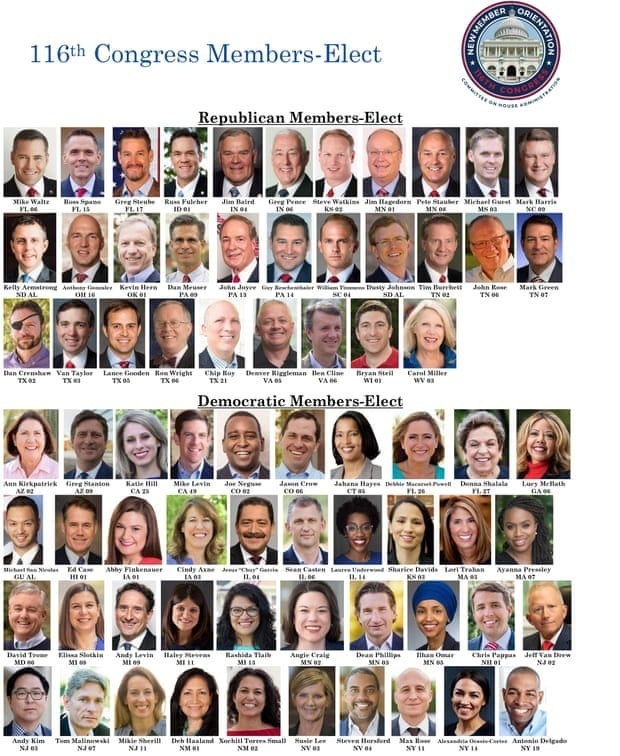 It's clear from Wednesday's freshman class photo of the 116th Congress that the members-elect are set to change the composition of both chambers quite visibly they head to Washington in January. Among the most notable changes, given the recent cultural shifts in the wake of the #MeToo movement and the Kavanaugh hearings, is the addition of 35 female lawmakers, bringing the total number of women in the 116th Congress to a record (of at least) 124, up from 107 in the current Congress, as the Wall Street Journal reports. 13 of the newly elected female representatives are nonwhite. LGBT breakthroughs include Democrat members-elect Sharice Davids (D.-Kan.), the first LGBT Kansan elected to Congress, and Kyrsten Sinema (D.-Ariz.), the first openly bisexual person ever elected to the U.S. Senate. The first Muslim women were elected to the House: Ilhan Omar (D.-Minn.), a Somali-American, and Rashida Tlaib (D.-Mich.), a Palestinian-American. Two new Native American women were elected to the House: Deb Haaland (D.-N.M.) and Sharice Davids (D.-Kan.). Ayanna Pressley (D.-Mass.) is the first black woman elected to Congress in Massachusetts. Sylvia Garcia (D.-Tex.) is the first Latina to represent Texas in the House. The increased diversity of the 116th Congress comes almost entirely from Democrats, considering all Republican members-elect are white men except for one female representative. For Democrats, tweaking the composition of Congress to more closely match national demographics seems to be a bigger priority. "It brings a different perspective to the table," Rep.-elect Kendra Horn, from Oklahoma, told the Washington Post, adding: "I'm very excited to be part of this new class that looks a lot more like our communities."